A century in cricket occurs when a batsman scores 100 runs or more in an innings, 43 Australia players have scored centuries in One Day Internationals. * denotes that the batsman remained not out. 50s denotes the number of times the players scored 50 or more during an innings. Maiden century and Date give the details of the player's first century. Ricky Ponting: His 29 centuries is a record for Australia. Mark Waugh: Second leading century maker for Australia with 18. ^ "Statistics / Statsguru / ODI matches / Batting records / Australia ODI century scorers". ESPN Cricinfo. ^ "Statistics / Statsguru / ODI matches / Batting records / Australia ODI century innings by innings list". ESPN Cricinfo. In the sport of cricket, a century is a score of 100 or more runs in a single innings by a batsman. The term is included in century partnership which occurs when two batsmen add 100 runs to the team total when they are batting together. A century is regarded as a score for batsmen and a players number of centuries is generally recorded in his career statistics. Scoring a century is loosely equivalent in merit to a bowler taking five wickets in an innings, scores of more than 200 runs are still statistically counted as a century, although these scores are referred as double and quadruple centuries, and so on. 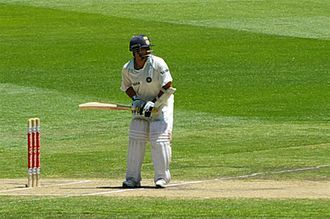 Accordingly, reaching 50 runs in an innings is known as a half-century, if the batsman goes on to score a century, the half-century is succeeded in statistics by the century. Centuries were uncommon until the late 19th century because of the difficulties in batting on pitches that had only rudimentary preparation and were exposed to the elements. There is doubt about the earliest known century, but the most definite claim belongs to John Minshull who scored 107 for the Duke of Dorsets XI v Wrotham at Sevenoaks Vine on 31 August 1769. The first definite century in a match was scored by John Small when he made 136 for Hampshire v Surrey at Broadhalfpenny Down in July 1775. The earliest known century partnership was recorded in 1767 between two Hambledon batsmen who added 192 for the first wicket against Caterham. It is believed they were Tom Sueter and Edward Curry Aburrow and it is almost certain that at least one of them scored an individual century, but there is no confirmation in the sources. When Hambledon played Kent at Broadhalfpenny in August 1768, the Reading Mercury reported, what is remarkable, one Mr Small, of Petersfield. Unfortunately it is not known if Small did this in one innings or if it was his match total, W. G. Grace was the first batsman to score 100 career centuries in first-class cricket, reaching the milestone in 1895. His career total of 124 centuries was subsequently passed by Jack Hobbs, the first century in Test cricket was scored by Charles Bannerman who scored 165 in the first ever Test between Australia and England. Bangalore /bæŋɡəˈlɔːr/, officially known as Bengaluru, is the capital of the Indian state of Karnataka. 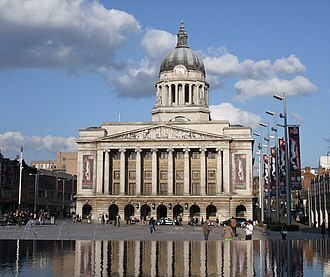 It has a population of about 8.42 million and a population of about 8.52 million, making it the third most populous city. It is located in southern India on the Deccan Plateau and its elevation is over 900 m above sea level, the highest of Indias major cities. 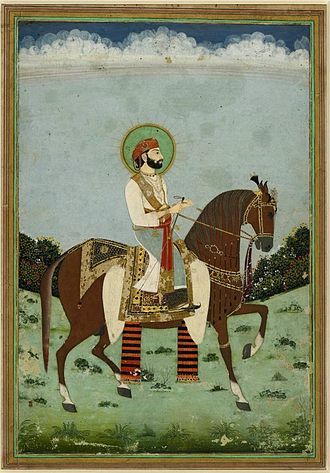 In 1638, the Marāthās conquered and ruled Bangalore for almost 50 years, after which the Mughals captured and it was captured by the British after victory in the Fourth Anglo-Mysore War, who returned administrative control of the city to the Maharaja of Mysore. The old city developed in the dominions of the Maharaja of Mysore and was capital of the Princely State of Mysore. In 1809, the British shifted their cantonment to Bangalore, outside the old city, and a grew up around it. Following Indias independence in 1947, Bangalore became the capital of Mysore State, the two urban settlements of Bangalore – city and cantonment – which had developed as independent entities merged into a single urban centre in 1949. The existing Kannada name, Bengalūru, was declared the name of the city in 2006. Bangalore is sometimes referred to as the Silicon Valley of India because of its role as the leading information technology exporter. Indian technological organisations ISRO, Wipro and HAL are headquartered in the city, a demographically diverse city, Bangalore is the second fastest-growing major metropolis in India. Numerous state-owned aerospace and defence organisations, such as Bharat Electronics, Hindustan Aeronautics, the city houses the Kannada film industry. The name Bangalore represents a version of the Kannada language name. It is the name of a village near kodegehalli and was copied by Kempegowda to the city of Bangalore, Bangalore was built on a venue earlier called as Shivanasamudram in the 16th century. The earliest reference to the name Bengalūru was found in a ninth-century Western Ganga Dynasty stone inscription on a vīra gallu, in this inscription found in Begur, Bengalūrū is referred to as a place in which a battle was fought in 890 CE. 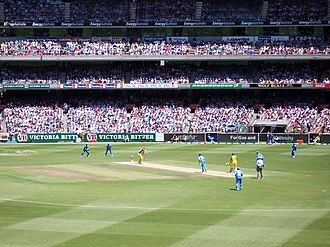 The Sydney Cricket Ground is a sports stadium in Sydney, Australia. 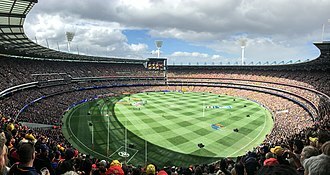 It is used for Test cricket, One Day International cricket, Twenty20 cricket and Australian rules football, as well as rugby league football. It is the ground for the New South Wales Blues cricket team, the Sydney Sixers of the Big Bash League. 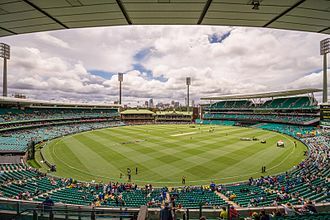 It is owned and operated by the Sydney Cricket Ground Trust that manages the Sydney Football Stadium located next door, until the 44,000 seat Football Stadium opened in 1988, the Sydney Cricket Ground was the major rugby league venue in Sydney. Part sandhills, part swamp and situated on the fringe of the city, it was used as a rubbish dump in the 1850s. In 1851, part of the Sydney Common south of Victoria Barracks was granted to the British Army for use as a garden and its first user was the 11th North Devonshire Regiment which flattened and graded the southern part of the rifle range adjacent to the Barracks. In the next couple of years, the teams from Victoria Barracks combined themselves into a permanent organisation. The ground therefore became known as the Garrison Ground when it was first opened in February 1854, in the late 1860s another part of the Sydney Common, the area west of the Garrison Ground to the Dowling Street, was opened for public recreation. 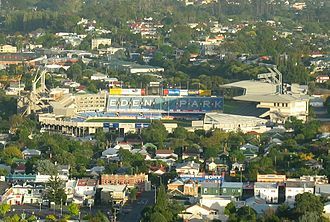 It was named Moore Park after the Mayor of Sydney, Charles Moore, as well as the location of Sydneys first zoo, Moore Park was a regular venue for games between Sydney rugby clubs Sydney University and the Wallaroos. 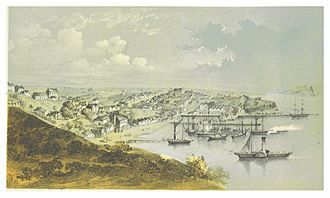 Sydney at the time was a small, dense city and best navigated on foot and it was not liked so much by cricketers because it was too far from the city. When the commander of the Sydney garrison, Lieutenant-Colonel John Richardson, aligned his soldiers to the East Sydney Cricket Club, in 1870 British troops left Victoria barracks and the future of the Civil and Military Ground became uncertain. However, with the closure of the Albert Ground in the 1870s, in 1875 the NSW Government began to upgrade the ground. In 1876, the ground was dedicated by Governor Sir Hercules Robinson, Driver himself was a prominent MP and solicitor for the City of Sydney Council. Visakhapatnam is the largest city, both in terms of area and population in the Indian state of Andhra Pradesh. It is located on the coast of Bay of Bengal in the eastern region of the state. It is the headquarters of Visakhapatnam district and the Financial Capital of Andhra Pradesh. As of 2011, the population of the city was recorded as 2,035,922, making it the 14th largest city in the country, Visakhapatnam Port is the fifth busiest port in India in terms of cargo handled. Visakhapatnam is home to the oldest shipyard and the natural harbour on the east coast of India. Visakhapatnams history stretches back to the 6th century BCE, historically, it was considered part of the Kalinga ancient region, and ruled by the Vengi kingdom, the Pallava and Eastern Ganga dynasties. 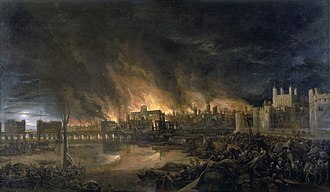 Conquered by the Mughals in the 16th century, European powers eventually set up trading interests in the city, control passed to the British in 1804 and it remained under British colonial rule until Indias independence in 1947. After independence, Visakhapatnam developed into one of the chief ports. The city is located between the Eastern Ghats mountain range and the Bay of Bengal, and is known as The Jewel of the East Coast, The City of Destiny. Visakhapatnams beaches, parks and proximity to areas of beauty have helped the city become a significant tourist destination. Visakhapatnam has been selected as one of the hundred Indian cities to be developed as a city under PM Narendra Modis flagship Smart Cities Mission. Visakhapatnam was ranked as the fifth cleanest city in India according to the governments Swachhta Sarvekshan rankings, the name Visakhapatnam was derived from the shrine of God Visakha, built by a King of Andhrain 4th century. The city coordinates lies between 17. 6883° N latitude, and 83. 2186° E longitude and its periphery consists of plains along the coast line while the interiors boast of the beautiful hills of the Eastern Ghats which surround it on the North and the West. This region is called the Agency Division. The M. Chinnaswamy Stadium, Kannada, ಎಂ. ಚಿನ್ನಸ್ವಾಮಿ ಕ್ರೀಡಾಂಗಣ located in Bengaluru, Karnataka, is one of the cricket stadiums of India. Flanked by the picturesque Cubbon Park, Queens Road and uptown MG Road and this stadium with a seating capacity of around 38,000 not only regularly hosts Test cricket, One Day Internationals and other First-class cricket matches, but other musical and cultural events. The stadium is the ground of the Karnataka state cricket team. It is owned by the Government of Karnataka and has leased out to the KSCA for a period of 99 years. The Chinnaswamy stadium is the first stadium in India, and probably the world and this has been procured as by the Go Green initiative of the KSCA. 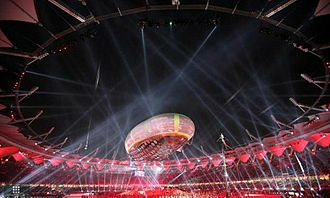 With generous patronage from the Government of Karnataka, the stone of this stadium was laid in 1969. The stadium was first used for First-class cricket matches during the 1972–73 season and it earned Test status during the 1974–75 season when the West Indies toured India. The first Test played at this stadium was on 22–29 November 1974, this was the debut Test match for the West Indian batting giants Viv Richards and Gordon Greenidge. The West Indians led by Clive Lloyd crushed M. A. K. Pataudis Indian team by a margin of 256 runs. India registered their first Test win on ground against the touring English team led by Tony Greig in 1976–77. The first ODI match at this venue was played on 6 September 1982, India defeated Sri Lanka by six wickets in that match. Floodlights were first installed at this stadium for the 1996 Wills World Cup, the first match played here under lights was the quarter-final clash between arch-rivals India and Pakistan on 9 March 1996 in which India defeated Pakistan by 39 runs in a thrilling encounter. In 2007, 3rd Test Match between India Vs Pakistan, Sourav Ganguly and Yuvraj Singh lead a 300 run partnership fightback from 61/4 breaking several records, indias 365/5 at stumps was the highest 1st day score in whole of India. The 300 run partnership was the highest partnership at the stadium, Sourav Gangulys 239 is the highest left-hander score. 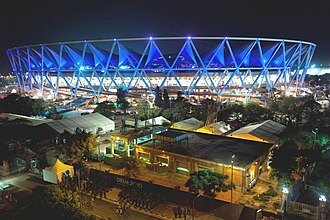 After the BCCI chose Bengaluru as the centre for the National Cricket Academy in 2000 and this stadium served as venue for the 1996 Miss World pageant. Headingley is a suburb of Leeds in West Yorkshire, England. 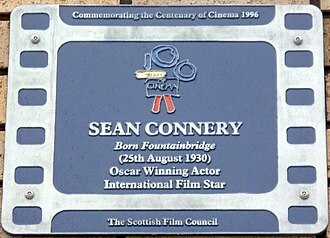 It is approximately two out of the city centre, to the north west along the A660 road. 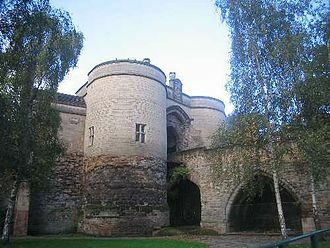 Headingley is notable for being the location of the Beckett Park campus for Leeds Beckett University, Headingley is first mentioned in the Domesday Book as Hedingelei or Hedingeleia in 1086 where it is recorded that Ilbert de Lacy held 7 carucates of land. The name is thought to derive from Old English Headinga of the descendants of Heada + lēah open ground, headda has sometimes been identified with Saint Hædde. However, a coffin found near Beckett Park in 1995 suggests there may have been an earlier settlement in late Roman or post-Roman times. From Viking times, Headingley was the centre of the wapentake of Skyrack, or Siaraches, the name may refer to an oak tree that was used as a meeting place for settling legal disputes and raising armies. An ancient oak, said to be the Shire Oak, stood to the north of St Michaels Church until 1941, and gives its name to two pubs, the Original Oak and the Skyrack. A map of 1711 shows Headingley as having a chapel and farmsteads scattered around a triangle of land formed by the merging of routes north, west. Enclosed fields were situated around the settlement with a tract of common land, Headingley Moor. In an 1801 census, Headingleys population is given as 300, an 1829 Act of Parliament enclosed Headingley Moor and the land was placed for sale. Around 30 workers cottages had by encroached upon the fringes of the moor before 1829, land in this vicinity was generally cheaper than that at Headingley Hill as it failed to attract the building of affluent villas. This brought about the building of smaller terraced housing around Moor Road, in the mid 19th century, Far Headingley had begun to develop over what was largely unclaimed common land. 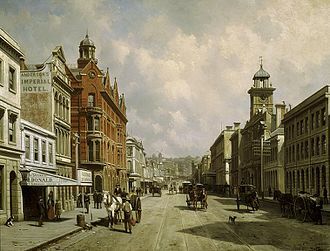 Headingley continued to be a village until the expansion of Leeds during the Industrial Revolution and became a suburb where the rich moved to escape the filth. In 1840, it became the site of Leeds Zoological and Botanical Gardens, despite the opening of Headingley railway station, serving the gardens, in 1849, the zoo was a loss-making venture and closed in 1858. Matthew Lawrence Hayden AM is a former Australian cricketer. Hayden was a powerful and aggressive left-handed opening batsman, known for his ability to score quickly at both Test and one day levels, Hayden holds the record for the highest score made by an Australian batsman in Tests. His innings of 201 against India in Chennai remains the 2nd highest score by an Australian in India and he formed one of the most prolific opening partnerships in world Test cricket for Australia with Justin Langer, and in ODI cricket with Adam Gilchrist. Hayden retired from all forms of cricket in September 2012, in 2017, Hayden was inducted into the Australian Cricket Hall of Fame. Hayden made his debut for the Australian team in the 4–8 March 1994 Test Match against South Africa in Johannesburg and his next Test selection was in the 1996–97 season, with three tests each against the West Indies and South Africa. He made his century, but averaged only 21.7 for the series with two ducks. He was dropped from the team, as the selectors favoured other openers, in particular Mark Taylor and Matthew Elliott, at the time, he was compared occasionally to Graeme Hick, a fine domestic performer but not quite good enough to make it at the highest level. During these years, Hayden was a batsman for the Queensland first-class cricket team. Weight of domestic cricket runs, and persistence, resulted in a resurrection of his career for the 1999–2000 tour of New Zealand. In the subsequent 2000–01 tour of India, he scored 549 runs, after that, he was an automatic selection for the Test side. He scored over 1,000 Test runs in 2001,2002,2003,2004, and 2005 and he was selected as one of Wisdens five 2003 Cricketers of the Year. Haydens total remained the record until 12 April 2004, when Lara scored 400 not out, as of December 2011, it remains the second-highest innings in Test history, and is the highest ever by an Australian. Hayden suffered a considerable form-slump towards the end of 2004, and he performed well in the 2007–2008 summer against India, aggregating over 400 runs with three centuries in the four tests-series, to bring his career total to thirty centuries. In the first test at Melbourne, Hayden scored his 28th test century, in the second test against India at Sydney, Hayden scored his 29th test century in his 93rd test match to equal Bradmans haul of 29 test tons. The Original Oak, named after the Skyrack Oak which grew opposite. The Skyrack, historical remnants of the Wapentake. Terrace houses typical of the southern districts of Headingley. Sachin Tendulkar of India holds the record of highest number of runs and centuries scored in both Test and ODI forms of cricket.